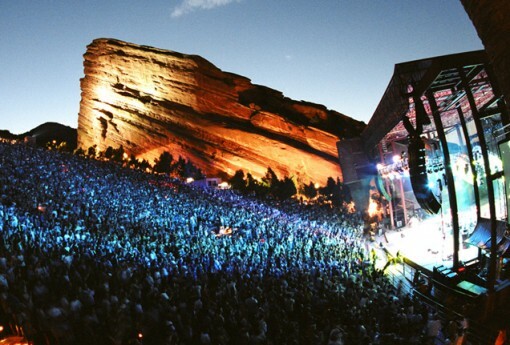 Red Rocks is the mecca of music venues. This amphitheater near Morrison, CO is often ranked as the best setting in the world to take in a show alongside places like The Gorge, Hollywood Bowl, The Greek, Slane Castle, and Royal Albert Hall among others. The list of acts that have performed on the hallowed Red Rocks stage reads like a Who’s Who of music history: The Beatles, U2, The Grateful Dead and Jimi Hendrix just to name a few. In 2013, some performers from our little music scene were invited to join the talented roster of acts to take the Red Rocks stage. I was unable to make it the inaugural concert that featured Randy Rogers Band, Wade Bowen, Stoney LaRue and Casey Donahew. So, as soon as plans were announced for a 2014 version of the show, my plans were set in motion. I had to be there. And I was. What began with a 4AM alarm and hurried trip to DFW airport would end in a remote cabin in Evergreen, CO.
Red Rocks is majestic and magical. You could really run out of adjectives to describe it. What Wrigley is to baseball, Pebble Beach to golf, Madison Square Garden to basketball…that’s what Red Rocks is to music. It is the venue. It’s nestled outside of Denver in the mountainside. It’s literally carved from the earth. There is no bad sightline and the vistas are breathtaking. The sound can be spotty depending on which way and how hard the wind is blowing, but overall there are moments that a PA isn’t even required. Getting to the venue can be an adventure if you don’t know what you’re doing. Twisting, winding mountain roads lead to seemingly nowhere until you see Red Rocks beckoning on the hillside. In a sea of green mountainsides, it’s broad red tops jut out and invite you to come see what the fuss is about. We parked on the south side and this led to quite a hike to enter the show. It appeared that folks who parked on the opposite side had a less stringent walk, but that could be wrong. Everything about the place is grand and special, including the $8 beer prices. When I ordered a “Coors Original”, I was immediately outed as a Texan by the beer vendor. He explained that locals call it “Currrs”, which resembled the way I’d heard some rednecks at the dirt track growing up refer to the Golden brand. Our gracious local hosts, Courtney and Rob, assured me that the beer vendor was crazy. The weather had been troubling all day long. Rainy and chilly. The sun wasn’t coming out to play and each passing hour, it seemed to get a little more windy and miserable. As we were entering the venue, the sound system was blaring CCR’s “Who’ll Stop the Rain”. Fitting. And, I assume the good Lord was listening because it cleared off about 20 minutes before showtime. We settled on some seats about 25 rows back and close to the center and soundboard. We could see the Denver skyline in the distance and had a great view of the stage as well. I scoped out the merch stand, bathroom situation and vetted our concert neighbors. The last part had me troubled when Kyle Park strode out to start the show acoustic and my neighbor asked me: is that was Randy Rogers? And why is Randy Rogers opening the show? Isn’t he the headliner? After I explained that was Mr. Park on the stage, we settled in for music. Turnpike Troubadours took the stage next to the sounds of Shinyribs “Take Me Lake Charles” and rightfully had all the confident swagger of the hottest band on the circuit. Evan Felker’s voice sounded a tad strained, but this was a band in control and at their peak. The crowd grew rowdy and raucous during their set…but always respectful. They bobbed along and sloshed beer on one another without being ornery. It was all in the name of a good time. Turnpike played hit after hit after hit. They held the throttle down throughout the set and played everything you’d want to hear. The sun came out full blast during their set and the whole mood within Red Rocks lifted with it. After relatively quick set change due to all rigs and drums being on rolling risers, Casey Donahew arrived on stage next. It is no secret that we at this website are no fans of his music. I think it’s trite, simplified, pandering and full of inauthenticity. However, his band is good and they do put on what could be termed as a good show. It was my first time to sit through a Donahew set in a number of years. The whole thing was boisterous and raucous. The choreographed moves and canned speeches that he probably gives at each show were not lost on this Colorado crowd. Despite being one of the few native Texans in attendance, you’d have been fooled by that fact based on the crowd response to “Stockyards is My Backyard”. Fort Worth’s population grew immensely during that song. Weird. I just don’t think I could ever scream along and pump my fist to a song about another state. About 2/3 of the crowd, which was nearly capacity by this point, really seemed to dig Donahew’s whole deal and I was part of the third that did not. But that’s okay, I’m not his target demo. Another set change followed and some spectacular stage lighting was unveiled. By now, the sun had set and the scene was set for a special set from the Randy Rogers Band. The RRB boys began with “Fuzzy” and then followed with a string of songs that were a bit more old school. It was super cool to hear them tearing through songs I’ve heard so many times in other settings in such a unique environment. The crowd was screaming along and dancing in the wide aisles with every note. At one point, Randy made the comment “I grew up listening to my dad’s record collection…Willie, Glen Campbell, The Beatles…The Stones…I’m pretty sure my dad’s record collection is why we’re at Red Rocks tonight.” That wide range of influences has always been at the root of RRB’s sound and success. No other band is able to as nimbly mix country and rock’s best elements into a sound all their own. This skill was certainly on display at Red Rocks on this Memorial Day Eve. Toward the end of the RRB set, things just turned surreal. I began to feel like I was having an out of body experience. The hectic travel day, altitutde and music were combining to make me feel like I was dreaming. A few hours earlier I’d been sitting in drought ravaged central Texas. Now I was on the side of a mountain in a breathtaking venue listening to one of my favorite bands. Life is crazy like that sometimes. Once we dodged the bears and foxes on the mountain roads back to our friend’s cabin, things began to set in. I’d just kicked something off the ol’ bucket list. The silence in front of me juxtaposed perfectly with the music I’d been enjoying for the previous few hours. 12 hours later I was back in Texas and back to reality. The whirlwind of a 24 hours still ringing in my ears. Red Rocks lived up to my expectations and exceeded them. If you’re a music fan, I can’t encourage you enough to get to a show at Red Rocks. It’s truly special. I’m already looking forward to my next Red Rocks whirlwind. You nailed it ! We were there Tuesdaynight , and although it was Aug.8 – it was chilly and wet . Not enough adjectives as you say — and glad to know I wasn’t wrong about the wind having some effect on sound . “If you’re a music fan …” EXACTLY . Can’t wait to return as well . I was educating at the health club recently and I was doing mysecond-to-last set of clean and also jerks. I just want to say I’m all new to weblog and absolutely loved this web page. Likely I’m want to bookmark your blog . You certainly have fabulous articles. Cheers for sharing your web-site. Thanks for another excellent post. The place else may just anyone get that kind of information in such a perfect manner of writing? I have a presentation next week, and I am at the look for such information. Hello there, I discovered your blog by the use of Google whilst searching for a related subject, your web site came up, it appears great. I have bookmarked it in my google bookmarks.